Plant Now for Late Summer and Fall Blooms and Bounty! 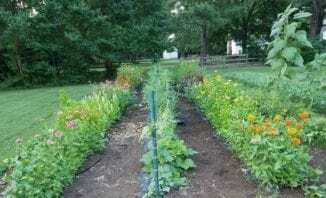 To have a full garden in late summer and fall plant in summer! Pretty sure you’ve heard me references this before or maybe even whine about it a bit: it is not too late to plant! There is always a flower or vegetable to start from seed and/or to plant — and summer is no exception. Several weekly plantings of sunflowers that will provide continuous blooms. The secret to success for the gardener and farmer to have a constant supply of top quality abundance in the garden is to do several plantings over time. I didn’t plant 15,000 zinnia plants at the same time, they were planted over a three and half month period. This in turns mean that they aren’t all starting to bloom at the same time either–however they all do tend to bloom until the end of the season if left in the garden. This is called succession planting. In place of planting your entire garden at once, make several small planting over several weeks or months. This spreads out the work and the harvest. So it is mid-summer here in the mid-atlantic region and what seeds am I starting indoors? We are starting our fourth round of seeds of warm-season tender annuals like zinnias, cockscomb, celosia plumes, marigolds, ageratums, fragrant foliage basil, millet grasses, sunflowers (weekly), tomatoes, cucumbers, squash and a few other bits and pieces. There are many seeds that can be planted directly in the garden with fairly good success at this time of the year because the soil is warm and the days are long and hot. 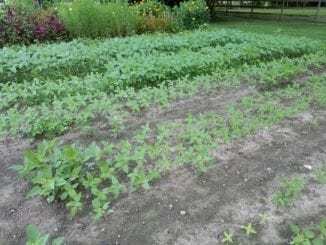 Direct seeding into the garden works well for beans, squash, zinnias, sunflowers and of course cover crops. It’s not too late! Plant for late summer and fall blooms and bounty now. Lisa Mason Ziegler is a commercial cut-flower farmer in Newport News, Virginia; she lectures and writes about organic and sustainable gardening. You can email Lisa at lisa@shoptgw.com , call her at 757-877-7159 or visit her websitewww.shoptgw.com .